Groteskia. A world of the splatter-elf genre. A world where the oceans are made of cracked ice and giant snake gods torture the denizens of the wastes and decrepit kings rule in castles long forgotten by time. A world that may or may not ever be populated with actual marauders, centaur vigilantes, an empire controlled by a floating eyeball, skeletal wyrms, long-tongued dragons, freaks, weirdos, wandering swordsmen, psycho witches, leopard mages, and hulking dwarf mechs. I made this map for the hell of it. It was pretty fun to make. I’ve been thinking more and more about this “splatter-elf” genre I came up with as a lark. I’m finding it could be the wild, weird, anything goes kind of genre I’ve been looking for. Just go full tilt and see what comes out. I’ve already dabbled in some writing that might be categorized as “wild and weird” but I never really put a name to it. I know some people don’t like categorizing themselves, but I like to do so for my own purposes sometimes. Like “this is my serious stuff” and “this is my insane stuff” and “this is my quirky stuff.” I find that fun myself. 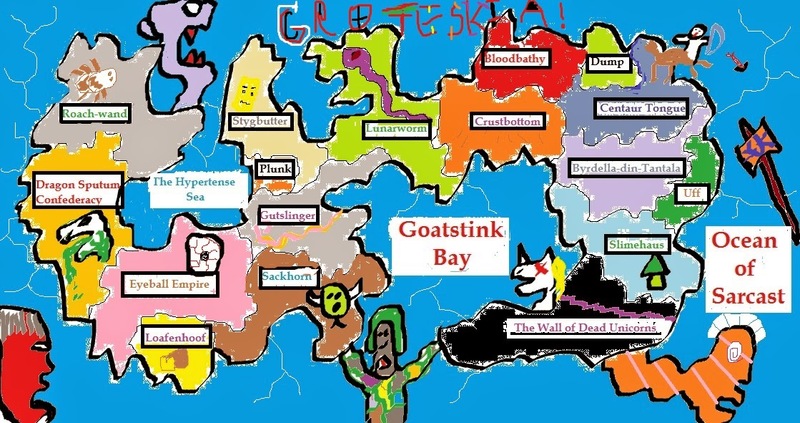 So shall Groteskia become a “real” world at some point? If it does, I’d love to see what kind of insanity spills out of it. I’m very happy there is a country just called “Dump” by the way.